Editor’s note: This post originally appeared on the Feed the Future blog. There are few things more American than these. Surprised to see agriculture on the list? Agriculture has and continues to be integral to the American experience. It was the primary driver of the economy when our nation was first born. It informed the perspectives and politics of our nation’s leaders. It shaped our uniquely American form of representative democracy. Our history with agriculture is long, storied, and we’ve learned a lot from years of trial, error and success. Consider George Washington, the first president of the United States. One of his primary aspirations was to be a successful farmer. In pursuit of greater efficiency, he applied the scientific method to farming and experimented with techniques and tools, many of which are still used today. He kept copious notes, sought advice, and shared what he learned with others. This spirit of curiosity, inventiveness and generosity is part of America’s DNA. We’ve changed the world with innovations like the light bulb, cotton gin and Internet. The Feed the Future initiative is bringing this U.S. ingenuity and expertise to bear to fight hunger. As we lead with focus and purpose and leverage our strengths, we are achieving transformational change at a large scale in a short amount of time. In fact, Feed the Future has evolved beyond just the U.S. Government into a broad movement that is tackling some of the world’s greatest challenges and developing solutions to emerging problems. And while we work with American companies, universities and nonprofits to share America’s agricultural expertise and entrepreneurial legacy with the world, that work has benefits back home, too. It strengthens the United States’ role as the world leader in improving lives and accelerating economic growth and opportunity. Progress today makes us safer, more prosperous, and better prepared to meet tomorrow’s challenges. Join us this spring as we tour through the various ways U.S. companies, universities, nonprofits and other organizations are making a difference, in large and small ways, to end global hunger. By working with partners like these to improve agriculture, Feed the Future is delivering results that are growing momentum toward a future free of hunger. What better way for America to lead? While the work to get us there is complex, the answer, as they say, is as easy as apple pie. Browse the maps below to find out which organizations in your state are contributing to this global movement to end hunger. Did you know that research conducted under Feed the Future tackles challenges common to U.S. and developing country farmers, such as drought, plant diseases, pests, food safety and food waste? 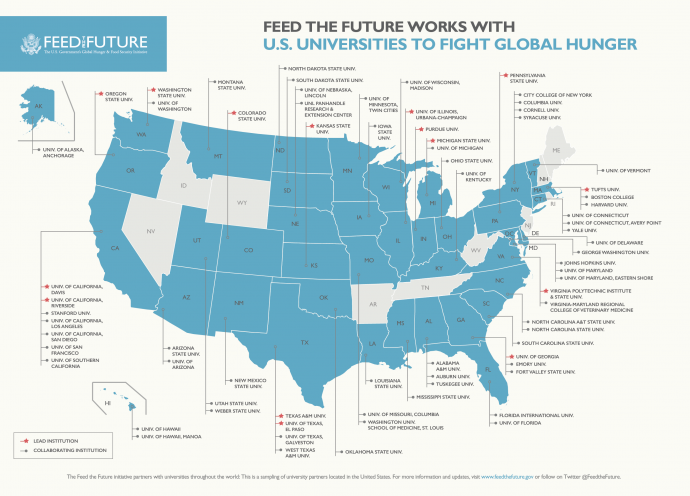 Feed the Future is connecting the best and brightest minds from America with those across the globe through its 24 Feed the Future Innovation Labs to develop solutions and take them from labs to the marketplace so farmers anywhere can access them. 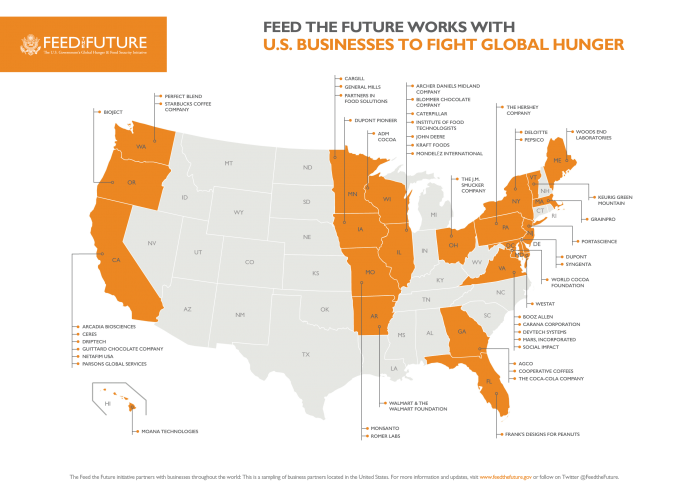 Did you know that Feed the Future partners with U.S. companies – large and small – where there are opportunities abroad to address development issues alongside business ones? By leveraging business interest, expertise and resources to build mutually beneficial projects, we’re creating lasting change that will live on (and multiply!). 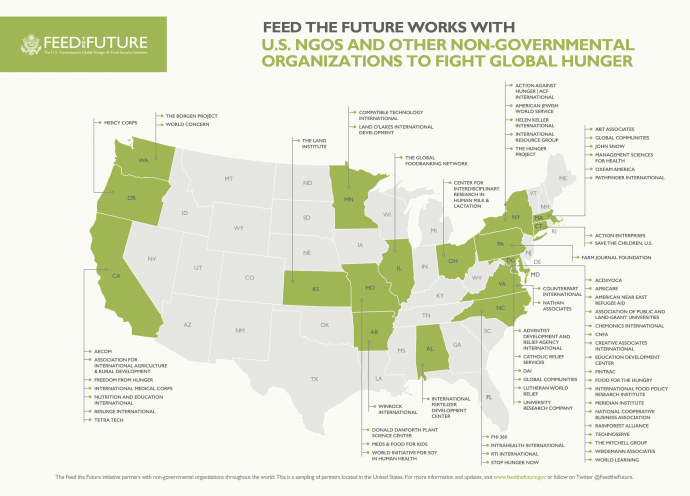 Did you know that nonprofits and NGOs helped make Feed the Future reality and continue to ensure progress made today lasts long into the future? Organizations like these do more than just implement projects on the ground; they hold us accountable and help us improve our work. Feeling inspired? Find out how you can join this global movement by visiting the “Partner With Us” section on the Feed the Future website.